Four members of staff took part in the Bupa Great South Run at Southsea on 26 October in aid of Chainreaction at the Kingsley Centre. Our staff raised £856.50 in sponsorships for this local charity, which offers support to disabled people. Steve Armstrong and Stuart Knight from Bordon, and Tim Knight and Colin Seager from Oakhanger participated in the 10 mile run, taking in Portsmouth’s landmarks including the Spinnaker Tower, HMS Victory and Southsea seafront. This year marked the 25th anniversary of the event. Steve said it was a great weekend for the run, especially when compared to the wind of last year. It was a bit cold when they were waiting to start but once they got going they appreciated that. They had a few injuries between them: Steve had an ongoing knee injury, Tim had a bad neck, and on mile 2 Stuart had a nasty trip. Ryan Morgan from Stuart Finch Builders (also with a bad knee) ran with Steve & Stuart. The crowds and fellow runners were amazing and helped push our runners to some good times. 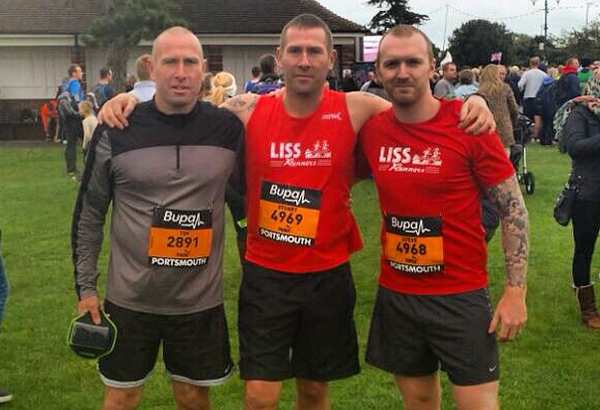 Steve & Stuart managed PBs, knocking a minute off their 2013 Great South Run times. The finishing times were: Tim 1:14:28 - Steve & Stuart 1:19:47 - Colin 1:33:52. On behalf of Coomers and Chainreaction - a very big thank you to our staff and sponsors!